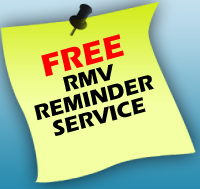 The RMV now offers a free reminder service, which reminds you by your contact preference (phone, text, email) when your license expires. The service will not notify you if your license has been revoked or suspended because of an outstanding obligation. In order to receive the service, you must make sure that you sign up at least 45 days before your license expires. After you sign up once, you will be notified 30 days in advance that your license expires. You can unsubscribe at any time, and you will continue to receive subsequent notifications of when your license will expire. To learn more, or to sign up, visit the RMV’s Reminder Service page.